You can't win 'em all, right? I feel like Monday + Tuesday were so fantastic in the Ruffle Your Feathers theme week, but my skirt for today didn't turn out quite right. Should you keep reading? Yes. The thing is, I made it to wear to ballet class, but it's a little too street-ish. You have to be able to dance and move in class. This would be adorable with leggings, though! You'll just need to make a slight change, but I'll explain that later. 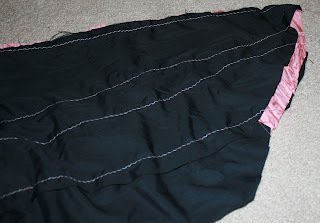 You can make this skirt with any scrap fabric you have, which is the best part. Ready for the steps? Me too. (1) Base it. Make the base of your dress. This is where you'll need to make the adjustment (unless you're making this skirt for ballet). I measured mine off at 76 inches, you'll want yours to be a minimum of 86 and use much less of a taper. You want yours to wrap in front still, but leave nothing exposed. Mine cuts quite a bit away in front so that my legs have freedom. To get the shape, I folded it in half and cut the edge so they'd match once unfolded. Measure out the height of your skirt based on your own body- mine is about 12". (2) Strip it. 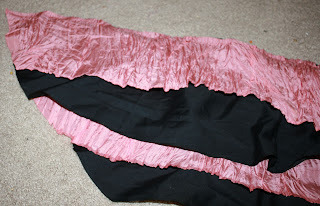 Cut out the strips of fabric to ruffle, then ruffle them (see previous post for gathering instructions if you've never done it before). I used 4 strips originally but ended up cutting off the bottom layer, it was too long for class. 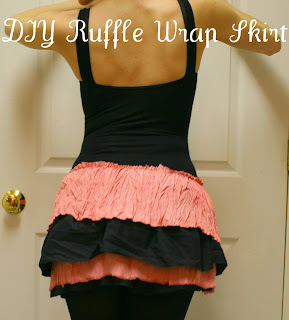 Remember to either hem the ruffles or else use Fray Check (my bff). (3) Attach it. 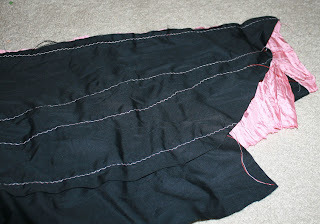 Add each of the layers (bottom first) on to your skirt. Sew them one after another all the way up to the top. (4) Trim it. You'll just flip it over (top photo) and trim the fabric to match the line/edge of your base (middle photo). Flip it back over... done (bottom photo). (5) Elasticize it. I added elastic to mine. I actually cut the elastic band out of a pair of John's old sweat pants in the donation pile. Just start by pinning the center of the elastic to the inside back center of the skirt. Begin to stitch it on, stretching the elastic out as you go (this is important!). There should be more fabric than elastic, because of the wrapping. However, if you want to make this skirt wrap-free (which would be super cute), just give it squared off edges and them them together at the end.